Maybe receiving 10 saber cuts during your entire military career sounds a lot, but not one soldier probably received more saber cuts than colonel Chipault of the 4th Cuirassiers who had received 52 sabre cuts in the battle of Heilsberg (10 June 1807). He fainted from bloodloss but after recovering, he could continue to serve his country (Nougaret, 1808, p. 305). Soldier suffering from head and facial injuries, profile inscribed “Waterloo”. Sabre wound to head, Hospital de la Gendarmerie, 5 July 1815. On the image can been seen that the head is shaven to make the treatment, usually suturing and bandaging, more easy. In his famous work Mémoires de chirurgie militaire et campagnes (Memories on military surgery and campaigns) Dominique Larrey (1766-1842) describes many of his operations on wounded soldiers. Most of the wounds Larrey and his assistents had to treat were caused by guns, but we can also find many references to wounds caused by sabers. Even Larrey himself was wounded twice (in the head and on the left shoulder by a saber at the battle of Waterloo, when he was trying to flee and even defended himself with his own two pistols and saber (Larrey, , 2004, II, p. 974). It is interesting to note that the wounds caused by edged weapons, even on the head, usually heal without problems and also quite quickly. In 1799, during the Egyptian campaign, lieutenant-colonel Paultre received several saber cuts and a thrust of a lance but he recovered after six weeks (Larrey, , 2004, I, p. 212). More serious was the wound of Pierre Soult, member of the 22nd Chasseurs, who obtained a heavy saber wound from a mameluk in his occipital bone (back bottom of the skull). This cut divided the extensor muscles of his head as far as the sixth vertebra of which the spinous process was cut. An enormous piece of skin was hanging on his shoulders and his chin fell on his chest. Though this wound looked horrible, Larrey sutured the infection and put it in bandage. The patient was fully recovered after a short amount of time, though Larrey adds in a footnote that the soldier could not produce any children anymore after suffering from this wound (Larrey, , 2004, I, p. 280). This mameluke cut was clearly meant to cut off the head of the French soldier, but soldiers could not only lose their head in battle! Larrey gives several examples of operations in which the face of soldiers was afflicted by saber wounds but nevertheless could be treated succesfully by suturing: Gardel (nose, cheek and part of his jaw bone), Thévenin (eyebrow, eyelid, cheekbone and cheek), Pierre Leclerc (nose and cheek), Jerdet and Lejuste (nose) and Rivière Brocard (left part of head near the ear) (Larrey, , 2004, I, p. 590-592). General Dommanget received serveral saber blows in the battle of Moscow (1812), several cuts on his scalp, one on his lip and even a cut which damaged several teeth and made him look horribly and unrecognisable. Larrey removed several broken teeth, sutured the lip and the general could return to France. Later only a small scar was seen on his lip but no other deformity (Larrey, , 2004, II, 1148). Larrey was also succesful in operating the nose of a Russian colonel, whom he operated without leaving any deformity afterwards (Larrey, , 2004, II, p. 734-735). It is interesting to note that Larrey adds that he did an operation which left the patient afterwards without any scar or only a small scar. Surprisingly not many images can be found of soldiers and officers with scars on their heads, as a result of saber wounds. During the Battle of Waterloo, Pierre-François Durutte (1767-1827), commander of the 4th devidion received two heavy saber blows: one in the face and one on the right hand, which had to be amputated the day after. Joachim Hyppolite Lepic (1768-1835), brother of the famous general Lepic, received several saber cuts in his entire career. On this image one can clearly see the scar on his face, made by a saber in June 1807. But not only the upper part of the body was a target, François Bernard was wounded by a saber in his lower abdomen. Some of the intestines had come out, but Larrey could put them back and the patient recovered after six weeks (Larrey, , 2004, I, p. 592). During the Russian campaign (1812) Larey had to operate a certain Arbette, who received a saber thrust in his lower abdomen. Though the patient suffered terribly from inflammation, he did recover after about one month (Larrey, , 2004, II, p. 865). Larrey also mentions the case of officer Netherwood who received a very deep cut from a mameluke during the Egyptian campaign. A mameluke saber cut him very deep in the right thigh but Larrey could suture Netherwood with about ten stitches, after which the patient could walk back as before (Larrey, , 2004, II, p. 1172). In certain cases, certainly when surgeons feared for the risk of gangrene (Larrey, , 2004, I, p. 455 and 642-643), an amputation of the wounded member was necessary, as the case of colonel Sourd illustrates. Sourd was colonel of the 20th regiment of the Chasseurs à cheval and was wounded several times by saber cuts on the right arm. Two wounds were situated on the joints of the wrist and the elbow but a third cut had gone through the muscles in the arm until it reached the bone. Larrey and his assistants judged that an amputation was necessary and performed the operation, during which Sourd did not show any signs of pain and even dictated a letter to the Emperor asking that he could keep the command of his regiment. The bandage was nearly attached when Sourd mounted and went back to the battle and survived (Larrey, , 2004, II, p. 973 and 1182). Sometimes amputation wasn’t a succes and the patient died immediately after the amputation, as the case of Joseph Grandi illustrated, where he received a saber cut to the joint of his right knee (Larrey, , 2004, I, p. 443). The patient could also die after a few days: Jean Lapaix also suffered from a saber cut in his right knee. Lapaix asked for the amputation after five days, and in the beginning he seemed to heal but after fifteen days he died anyway. Larrey adds that he had seen many similar cases of people dying because the doctors were afraid to amputate (Larrey, , 2004, I, p. 443-444). The example of Sourd illustrates that the wrist and arm were a possible target and this is also the body parts where Pierre Larrey was wounded in 1810. Inflammation in his wound had already started, so Larrey executed the amputation in less than one minute and the patient survived (Larrey, , 2004, I, p.280). The most bizzare wound treated by Larrey happened during the second battle of Aboukir (1799). When general Dermoncourt was leading his troops, his saber was broken by a large musket ball. The broken saber blade flew through the air and struck a soldier behind Dermoncourt in his thigh about 4 to 5 cm deep! When other soldiers saw this wound, they were very angry at the enemy because they thought they charged their cannons with broken saber blades! Larrey adds to this story that he explained to the soldiers what really had happened and that this wound was not so special for him because he had seen many similar cases during his entire campaign. Larrey also adds that the healing of the soldier went without problems (Larrey, , 2004, II, 1142). Since many saber cuts were aimed at the head, soldiers wore shakos or sometimes even leather helmets, reinforced with a brass band (Crowdy, 2015,72). The anecdote of Marbot in Spain illustrates how even simple shakos, without brass or iron bands, could provide a degree of protection against blows to the head. Cuirassiers and carabiniers had beautifully decorated steel helmets which provided better protection. Notice the wounded soldier with cadenettes. 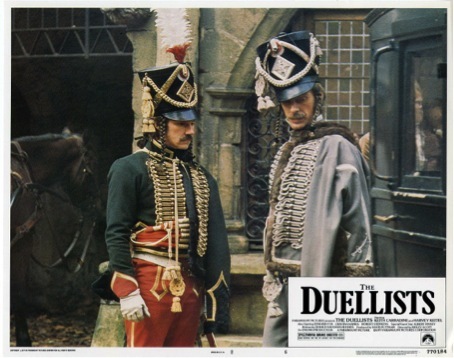 Harvey Keitel and Keith Carradine in The Duellists (Ridley Scott, 1977), both of them with cadenettes. Unfortunately not much can be found about Napoleon’s own martial skills. As a young child of ten years old, he went to the Ecole Militaire royale in Brienne-le-Château, near Troyes in the Champagne region. Every day the young students had eight hours of study: mathematics, Latin, history, German, geography, natural sciences, science of fortifications and of weapons, dancing, music and also fencing. In 1784 Napoleon graduated at Brienne and was admitted to the very prestigiuos Ecole Royale Militaire near the Seine in Paris. Here he had the same courses as in Brienne, but without history of strategy and battle. New courses were musket shooting, military marching and horse riding (Roberts, 2015, p. 32 and 38). In Brienne his achievements in fencing and dancing had been marked as ‘very poor’, but in Paris he became better and was known for the amount of blades he had broken (Cohen, 2010, p. 96). After the graduation of Napoleon at the Ecole Royale, there are no more references to Napoleon’s personal achievements with the saber, though he had a huge collection of decorated sabers – even one in his coffin (Op de Beeck, 2014b, p. 728)! – and despite being almost always depicted with a (mameluke) saber or smallsword. One notable exception can be found at the end of Napoleon’s military career. In the Battle of of Arcis-sur-Aube (20 March 1814), the emperor himself was at the head of his own troops and fought, saber in hand. It is quite possible that he was searching for his death on the battlefield, but could not find it (Op de Beeck, 2014b, p 530). The fencing lesson: Little (though he was 1m68, which was an average height in his time) Napoleon is fencing against von Blücher while a British sailor is juding the match. Blücher is supported by German peasants and even a Russian cossack. In contrast to many of his officers (Ney, Marbot, Augereau, baron de Lasalle…) there are no stories about Napoleon involved in duelling. When people challenged him to a duel, he simply declined, as was the case when the king of Sweden challenged him to duel with him (Cohen, 2010, p. 97). According to Mike Loades, Napoleon would have said: “It’s too bad that death often results from duelling, for duels otherwise help keep up politeness in society.” (Loades, 2010, p. 459). Though this quote seems to say that Napoleon didn’t have any problems with duelling, in reality he saw this as a waste of manpower. According to Elting “he especially disliked the professional duellist, whom he compared to a cannibal” (Elting, 1997, p. 97). Cohen also confirms this negative view of Napoleon’s against duelling: a good duellist made a bad soldier and besides this, many soldiers in his army had died or were seriously injured because of a matter of honour (Cohen, 2010, p. 97). Parquin tells an interesting story about Napoleon’s opposition against duelling. When the emperor saw the huge scar on the face of captain Lion, which was caused by duelling, he asked him where the scar came from. Lion replied that it happened in Ulm on which the emperor rewarded him, because he thought it happened during the Battle of Ulm (16-19 October 1805). Lion didn’t lie, because he received the wound in Ulm, not on the battlefield but in a duel… If the emperor would have known this, he would never have rewarded Lion (Parquin, (, 1892, p. 43). Without any doubt, the saber was not the most deadly, but certainly the most honourable weapon of Napoleonic warfare. It was not only an honourable weapon, but also an honest piece of steel which made a deadly connection between two men and sometimes even a woman. It forced two opponents to a beatiful dance of death in which people only could rely on their martial talents. It decided over life or death, light cut or serious injury, honour or shame. The steel was merciless, but could also be kind: wounds made people die in an instant and many times, when this was not the case, it made it possible for people to survive. A scar obtained from a saber was not something to wear with shame, but was a proud mark of bravery on the battlefield or in duel. The saber did not make a proper difference on the battlefield, but could turn death into survival for an individual soldier. With this article I originally wanted to give the reader a brief summary of the use of the saber in the army of Napoleon, but it became more than a short text… Upon writing I stumbled on so many interesting subjects connected to the use of the saber in the Napoleonic army. Frankly this article could have been a book and actually… it should be elaborated into a book dedicated to this subject. Personally I not only wanted to deal with fencing treatises (by the way: when can we expect an English translation of Christmann?) different kind of sabers, but also with wounds caused by sabers, honorary sabers and some other less known facts about the use of the saber. For me it was also very important to use as many primary sources as possible and honestly, I think many more and many more interesting personal experiences of soldiers in the army of Napoleon can be found…. Just to give the reader an idea: The Fondation Napoleon has put more than 5000 contemporary Napoleonic documents online… How many marvellous and interesting stories are waiting for us to be discovered? Just try to use ‘sabre’ as search term when browsing the writings of Marbot, Parquin, Coignet or Bourgogne… it will make your head dizzy! Sparring between Steven Sigmans and myself, Hallebardiers Bruges (Belgium). Experimenting with different kinds of sabers. Are there conclusions to be made for people practising military saber in the world of Historical European Martial Arts? My research has certainly proven that in combat the afterblow was very frequent: hitting someone on the head certainly didn’t cause his death (remember Louis-Ferdinand) and it was very important to riposte the attack of your wounded opponent. Fighting with the saber was a bloody mess and no matter how skilled you were, you could get wounded on the battlefield! Luckily good surgeons could help you and even after receiving many wounds you could still survive a fight and die of old age many years later (or die in another fight because of a gunshot or cannon ball). The bloody mess of a battle, being wounded (on the head) and continuing to fight, is something we can never imitate in HEMA or we would have to fight with sharp blades in Napoleonic uniforms. How sharp were individual blades of individual soldiers, how resistant was their body to a deep cut, covered in leather or other clothing? When did soldiers feel pain enough to leave the battlefield? I do believe there is an uncrossable gap between our present day HEMA and the world of Napoleonic soldiers who fought under harsh conditions, whose survival was dependant from their use of the sword, who wanted to achieve glory on the battlefield and shine in the eyes of their commanders or give the example in front of their men. Those are things from the past and will never return. But, dear lovers of the military saber, we must not cry! We can set up rules concerning the target zone (head only or also other parts of the body? ), the kind of hit (with a thrust or with a cut? ), the amount of protection (fencing jacket, gloves or only fencing mask?) and concerning the afterblow (one, two or three afterblows?). I also think it can be very valuable and interesting to experiment with different kind of sabers, because the French soldiers had to fence against Mamelukes with very curved sabers or cuirassiers with straight swords. Maybe this could be a challenge for the future of the military saber in HEMA? In writing this article I received valuable information from Matt Easton and Marcus Hampel. Special thanks go to La famille Bonaparte, Ken Broeders, illustrator and graphic novel artist/writer, expert on Napoleonic matter. Blocqueville, A.L. (,2013): Le Maréchal Davout, Prince d’Eckmühl. Correspondance Inédite, 1790-1815 Pologne- Russie- Hambourg. Forgotten Books, London. Butler, A.J. (, 2013), The memoirs of Baron de Late (2 vols). Forgotten Books, London. Charlet, Ph. and J.J. Pattyn (2013a): La baïonette et son maniement: L’escrime militaire au début du XIXe siècle. Alexandre Muller (Manuel d’Instruction: vol. 1). Historic ‘One, Gilly. Charlet, Ph. and J.J. Pattyn (2013b): Le sabre et l’escrime du cavalier: L’escrime militaire au début du XIXe siècle. Alexandre Muller (Manuel d’Instruction: vol. 2). Historic ‘One, Gilly. Christmann, F.C. and G. Pfeffinger (1838): Theoretisch-Praktische Anleitung des Hau und Stossfechtens und des Schwadronhauens nach einer ganz neuen Methode bearbeitet. Self published (? ), Offenbach am Main. Cottyn, P. and M. Hénault (,1910): Mémoires du sergent Bourgogne (1812-1813), publiés d’après le manuscrit original. Librarie Hachette et Compagnie, Paris. De La Roche-Aymon (1817): Troupes Légères, ou réflexions sur l’organisation, l’instruction et la tactique de l’infanterie et de la cavalerie légères. Magimel, Anselin et Pochard, Paris. de Saint Martin (1804): L’art de faire des armes réduit à ses vrais principes. Imprimerie de Janne Schrämble, Vienna. Figueur, T. (1842): Les campagnes de mademoiselle Thérèse Figueur, aujourd’hui Madame Veuve Sutter, ex-dragon aux 15e et 9e régimens, de 1793 a 1815, écrites sous sa dictée par St.-Germain Leduc. Dauvin et Fontaine, Paris. Girard, P.J.F. (1736): Nouveau traité de la perfection sur le fait des armes, dédie au roy, par le Sr. P.J.F. Girard, ancien officier de marine, enseignant la manière de combattre de l’épee de pointe seule, toutes les gardes étrangeres, l’espadon, les piques, hallebardes, baïonettes au bout du fusil, fléaux brisés et batons à deux bouts; ensemble à faire bonne grâce les saluts de l’esponton, l’exercice du fusil, et celui de la grenadière, tels qu’ils se pratiquent aujour’hui dans l’art militaire de la France. Moette, Paris. Larchey, L. (,1883): Les cahiers du capitaine Coignet (1799-1815) publiés par Lorédan Larchey, d’après le manuscrit original avec gravures et autographe fac-similé. Librairie Hachette et Compagnie, Paris. Larrey, D. (,2004): Mémoires de chirurgie militaire et campagnes, I (1787-1811: Campagnes de l’Amérique Septentrionale, du Rhin, de Corse, des Alpes-Maritimes, de Catalogne, d’Italie, d’Egypte et de Syrie, de Boulogne, d’Ulm et d’Austerlitz, de Saxe, de Prusse, de Pologne, d’Espagne et d’Autriche avec planches. Tallendier Editions, Paris. Larrey, D. ([1817, 1841], 2004): Mémoires de chirurgie militaire et campagnes, II (Campagnes de Russie, de Saxe, et de France, relation Médicale de campagnes et voyages, annexes avec planches. Tallendier Editions, Paris. Nougaret, P.J.B. (1808): Anecdotes militaires, anciennes et modernes, des Français; contenant les actions sublimes et courageurses des généraux, des grands capitaines, des officiers et des soldats, les traits de dévouement extraordinaire de plusieurs villes assiégées, des particularités sur plusieurs batailles mémorables, soit de terre, soit de mer, et sur les stratagèmes de guerre curieux et remarquables. F. Louis, Paris. Parquin, D.-C. (, 1892): Récits de guerre: Souvenirs du capitaine Parquin 1803-1814. Boussod, Valadon et Compagnie, Paris. Rilliet, L. (, 2013): Journal d’un sous-lieutenant de cuirassiers 1810-1814, présenté et annoté par Olivier Lapray (Editions du Grenadier). Bernard Giovanangeli Editeur, Paris. Amberger, Chr. J. (1999): The secret history of the sword: Adventures in ancient martial arts. Multi-Media Books, Burbank. Amberger, Chr. J. (2008): Saber fencing: Germany, 1838. Barbero, A. (2010): Waterloo. Het verhaal van de veldslag. Mets & Schilt Uitgevers, Amsterdam. Briost, P., H. Drévillon and P. Serna (2002): Croiser le fer. Violence et culture de l’épe dans la France moderne (XVIe-XVIIIe siècle) (Les Classiques de Champ Vallon). Champ Vallon, Seyssel. Cardoza, T. (2010): Intrepid women. Cantinières and vivandières of the French army. 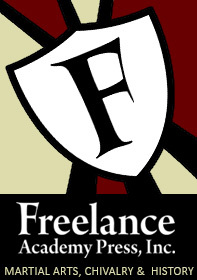 Indiana University Press, Indiana. Cohen, R. (2010): By the sword: gladiators, musketeers, samurai, swashbucklers, and Olympic champions. Simon and Schuster UK Ltd, London. Crowdy, T.E. (2015): Napoleon’s infantry handbook. Pen and Sword Military, Yorkshire. Elting, J.R. (1997, reprint of 1988): Swords around a throne: Napoleon’s Grande Armée. Da Capo Press, New York. Fermont Barnes, G. (ed.) (2006): Encyclopedia of the French Revolutionary and Napoleonic Wars. A political, social and military history. ABC Clio, Santa Barbara, Denver and Oxford. Gallaher, J.G. (2008): Napoleon’s enfant terrible: General Dominique Vandamme (Campaings and commanders 15). University of Oklahoma Press, Oklahoma. Haythornthwaite, Ph. (text) and P. Courcelle (Illustrations) (2001): Napoleon’s commanders (1) c. 1809-15 (Osprey Elite 72). Osprey Publishing, Oxford. Haythornthwaite, Ph. (text) and P. Courcelle (Illustrations) (2002a): Napoleon’s commanders (2) c. 1809-15 (Osprey Elite 83). Osprey Publishing, Oxford. Haythornthwaite, Ph. (2002b): Napoleonic cavalry (Napoleonic weapons and warfare). Cassell, London. Hughes, B.P. (1997): Firepower: weapons effectiveness on the battlefield 1630-1850. Sarpedon, New York. Loades, M. (2010): Swords and swordsmen. Pen and Sword Military, Yorkshire. Massoni, G.A (2008): Histoire d’un régiment de cavalerie légère : le 5e hussards 1783-1815. Archives & Culture, Paris. (1886) ‘Neipperg, Adam Adalbert Graf von’, Allgemeine Deutsche Biographie, band 23. Duncker und Humbolt, Leipzig, c. 408-412. Nosworthy, B. (1996): With musket, cannon and sword: battle tactics of Napoleon and his ennemies. Da Capo Press, London. Op de Beeck, J. (2012): Napoleons nachtmerrie. 1812: hoe de Keizer en zijn soldaten ten onder gingen in Rusland. Epo, Berchem. Op de Beeck, J. (2014a): Napoleon, deel I: Van strateeg tot keizer. Manteau, Amsterdam. Op de Beeck, J. (2014b): Napoleon, deel II: Van Keizer tot mythe. Manteau, Amsterdam. Pawly, R. (text) and P. Courcelle (illustrations) (2005): Napoleon’s carabiniers (Men-at-Arms 405). Osprey Publishing, Oxford. Pawly, R. (text) and P. Courcelle (illustrations) (2006): Napoleon’s mamelukes (Men-at-Arms 429). Osprey Publishing, Oxford. Roberts, A. (2015): Napoleon de Grote. Prometheus, Amsterdam. Reinhard, H. (2009): The book of swords. Baen Books, New York. Roucaud, M. (2007): ‘Etude des Avant-postes de cavalerie légère par le général de Brack’ Revue Historique des Armées 249, p. 110-113. Westwood, D.: ‘French Army’ in Fermont Barnes, G. (ed.) (2006) , Encyclopedia of the French Revolutionary and Napoleonic Wars. A political, social and military history. ABC Clio, Santa Barbara, Denver and Oxford, p. 373-378. Westwood, D.: ‘musket’ in Fermont Barnes, G. (ed.) (2006) , Encyclopedia of the French Revolutionary and Napoleonic Wars. A political, social and military history. ABC Clio, Santa Barbara, Denver and Oxford, p. 668-669. Westwood, D.: ‘rifle in Fermont Barnes, G. (ed.) (2006) , Encyclopedia of the French Revolutionary and Napoleonic Wars. A political, social and military history. ABC Clio, Santa Barbara, Denver and Oxford, p. 373-378. Westwood, D.: ‘Musket’ in Fermont Barnes, G. (ed.) (2006) , Encyclopedia of the French Revolutionary and Napoleonic Wars. A political, social and military history. ABC Clio, Santa Barbara, Denver and Oxford, p. 818.